Take an Extra $20 off Turkish Flight Deals. The coupon is valid only for flights with Turkish Airlines from U.S. to international destinations. Flash Sale! Get a $40 off any Flight from the US to an International Destination. Limited time offer. 15% Off Flights Within Chile. Get 15% Off Flights Within Chile. Sale Now On! Get up to 50% off All destinations worldwide. Sale is valid for selected pickups destinations. Sale applied to the standard online rates available for reservation on selected airport pickups and downtown locations from certain suppliers. Terms and Conditions apply. Travel between 06/01/2019 to 30/06/2019. Book between 06/01/2019 to 14/01/2019. Holiday Deals! Get 15% Off stays worldwide. Deal price applies to select stays now until 03/31/2019. Offer ends 01/14/2019. Save up to $50 when flying from US to Australia and New Zealand with Fiji Airways. Some restrictions may apply. Blackout dates for LAX/SFO (not applicable from HNL) Outbound-06/11/2018-07/08/2018, Inbound-07/09/2018-08/12/2018 and 01/10/2019-01/20/2019. Travel between 04/20/2018-12/09/2018 and 01/10/2019-03/31/2019. Book by 06/01/2018 from LAX/SFO/HNL to Nadi. Super International Sale With UIA! Save up to 40% on flights from New York to selected destinations including Tel Aviv, Warsaw, Dubai, Minsk, Tbilisi, and more. Get up to 50% off car rentals for selected pickups destinations.Applicable on selected airport pickups and downtown locations from certain suppliers. Offer not valid on cars where the selling price is set by the car hire supplier. Travel By 08/05/2018 to 10/31/2018. Book By 08/05/2018 to 08/15/2018. Cheap Flights To New York. Limited Time Only. 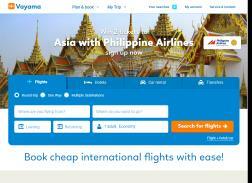 Vayama’s Airfare Deal Ticker – Grab the hottest airfare deals before they sell out. Get $25 Off flights from US to Europe. Limited time only.